The numbers of music meaning the numbers on the Musical Scale Chart are a feature of every page of this investigation but it is mostly not commented upon the most important numbers are generally found in Column G and their importance relates to their proximity to the number 3168. The number 198 is the furthest away and is not used as much as the other numbers, the number 396 is used a bit more but not as much as the next number 792 which has increased in importance and the rest of Column G’s numbers are generally even more important. For example the full design Pyramid’s volume of 79200³ reeds is worthy of note but is much more significant when defined as 0.0006336³ miles and it is worthy of note concerning column G numbers that the reed is 126.72” and the mile is 63360”. 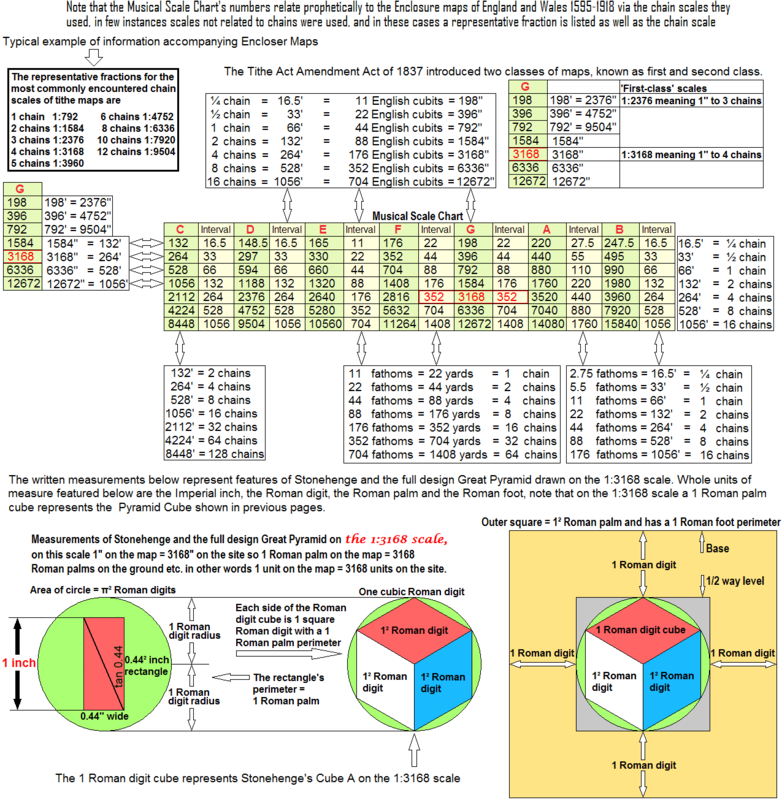 The rod = 198” and the reed = 126.72” column G begins with 198 and ends with 12672 the earth’s radius of 1980000 x 126.72” long reeds = 1267200 x 198” long rods or in other words the earth’s radius of 1980000 reeds = 126720000 rods. 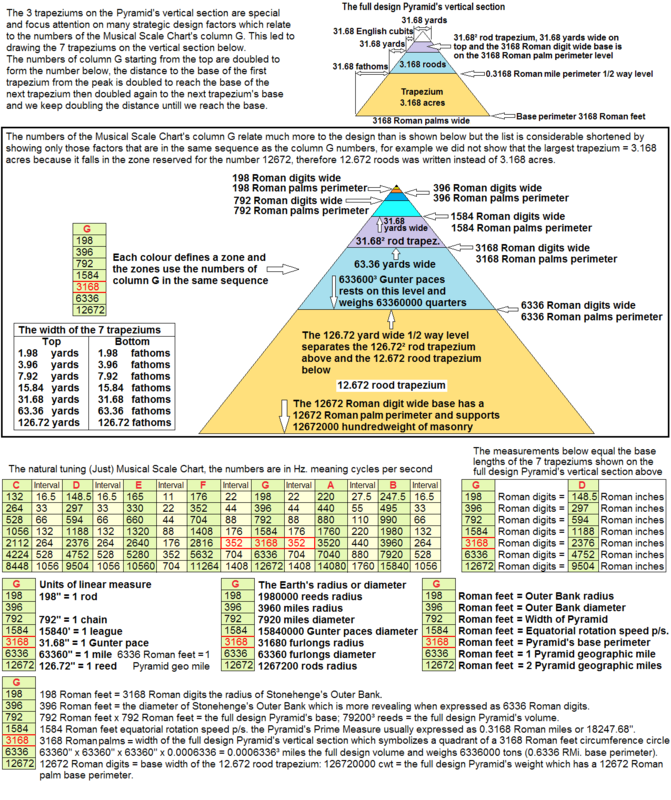 Other details not shown in the column of linear units of measure are the link = 7.92” and the furlong = 7920”; the league of 15840’ = 3.168 Old English miles; the Pyramid geographic mile = 63366 Roman feet, the Greek geographic stade = 633.6 Roman feet; the Greek geographic cubit = 1.584 Roman feet or 0.3168 Roman paces and the Greek geographic great cubit = 0.0003168 Roman leagues. Note, 10 Greek geographic stades = 1 Pyramid geographic mile. The numbers of the Musical Scale Chart are prophetic of the chain mapping scales used in the Enclosure Maps of England and Wales 1595-1918, the same scales were used all over the world in English speaking countries for cadastral maps etc. Edmund Gunter born 1581 was professor of astronomy at Gresham College London, he invented and made navigation instruments, printed the first table of logarithms and laid the groundwork for the slide rule. He introduced the 22 yard chain of 100 links, each 7.92” link was a solid bar, he also introduced the 31.68” Gunter pace. In Subsequent centuries the chain was used to produce maps and for obvious reasons we are interested in maps drawn using the 1:3168 scale (1” to 3168” or 1” to 4 chains). When we investigate how the 1:3168 scale relates to Stonehenge’s design and the Great Pyramid’s full design it reveals that the monuments are prophetic of the 1:3168 scale and of course the inch and the chain along with the Roman digit, the Roman palm and the Roman foot but we already knew all this except for the 1:3168 connection. In 1884 the north-south line at Greenwich was by international agreement designated the prime meridian 0° it is the reference meridian for all the other meridians of longitude which are numbered east or west of it. The Greenwich meridian also serves as the basis for the world’s standard time zone system. The mean solar time at Greenwich is now called Universal Time and was formerly called Greenwich Mean Time. Because the earth turns 15° per hour standard time theoretically becomes successively one hour earlier at each 15° longitude west of the Greenwich meridian and one hour later at each 15° longitude east. We have previously demonstrated how the reference to the Bethlehem coordinates on the Musical Scale Chart is prophetic of the above longitude system and reveals why it came into universal use. The latitude longitude system is a factor of comprehensive regional maps, national maps and especially world maps etc, and the Musical Scale Chart’s numbers are also prophetic of the mapping done via the various chain scales featured on this page. Theoretically the Prime Meridian (0°) is arbitrary but the Prime Parallel (0°) is not because it is the equator, when the international representatives met to decide which meridian to use as the Prime Meridian they probably had no idea the final decision had been made a very long time before they were born.